"If migration and the federal police do not allow us access, we will do the impossible to cross into Mexico," one migrant said. The U.S. government is now tracking a small group of immigrants from the Honduran migrant caravan who crossed into southern Mexico on Thursday night, a border President Donald Trump made clear he did not want the migrants to cross in order to prevent them from arriving at the U.S. southern border. The group of migrants, gathered in the town's central park, were preparing to make a decision by early afternoon about how to enter Mexico. Among the options: cross Tecun Uman's border bridge by foot and face detention or try to make it across the Succhiate River undetected. "If migration and the federal police do not allow us access, we will do the impossible to cross into Mexico," one of the migrants shouted to the others. Later Friday, six Mexican federal police officers were injured in an altercation with migrants along the border, Mexican authorities said. A separate group of roughly 500 migrants are expected to join the others later Friday. 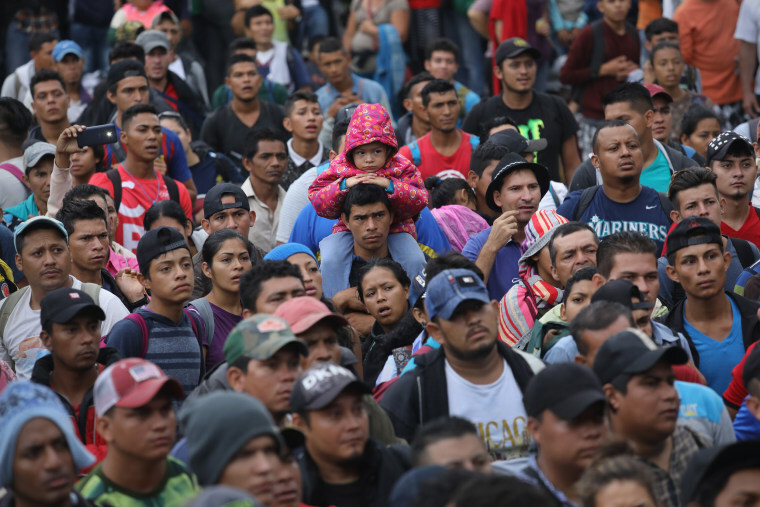 Another large caravan of roughly 1,000 Hondurans recently crossed into El Salvador as they make their way north. In a tweet on Thursday morning, Trump raised pressure on Mexico "to stop this onslaught," adding "if unable to do so I will call up the U.S. Military and CLOSE OUR SOUTHERN BORDER!" Trump on Friday thanked Mexico for its handling of the caravan and reiterated his vow to mobilize the military if needed. "It's being stopped as of this moment by Mexico," Trump said in Arizona. "So we appreciate very much what Mexico’s doing." Trump went on to declare that a number of the migrants are criminals. "A fairly big percentage of those people are criminals, and they wanna come into our country, and they’re criminals, and it’s not happening under my watch," he said. Meanwhile, Secretary of State Mike Pompeo traveled to Mexico to meet with his counterparts, where he will continue to pressure the country to stop migrants from passing through Mexico to the United States. Mexican President-elect Andres Manuel Lopez Obrador said his government will urge the U.S. and Canada to participate in a joint investment of about $30 billion for the development of projects and jobs to curb migration in the region. "We don't want temporary solutions because if the problem isn't addressed at the root people are always going to look for a way to improve their lives," Obrador said. "The people don't leave their villages for pleasure. They do it out of necessity." The migrants' travel patterns could trigger a crackdown on the border by the Trump administration. Senior administration officials say Trump is "dead serious" about taking drastic measures, including sealing the border, but is likely to hold off until after the Nov. 6 midterms. The first wave of the caravan is due to reach the United Stated border just around that time. The internal document said roughly 400 of the roughly 4,000 migrants who fled poverty and violence in Honduras have been repatriated, which means they were either deported or voluntarily returned to their country. Christopher Álvarez and Noah Levy contributed.